Today is a "Bad Weather Make-Up Day" for my kiddos and since we had NO SNOW DAYS they're out of school today. We're sleeping in and having a lazy morning. In typical Friday fashion I'm joining my girls, Narci and Andrea, to bring you some FAVORITES this Friday! First up, if you see my mama today please wish her a HAPPY 60TH BIRTHDAY! My mom is so selfless, hard working, such a servant, and loves us so well. Tab and I would never be able to getaway solo if it wasn't for her. She makes leaving for a trip so very easy. My kiddos all adore her-probably because she spoils them rotten. That's what Grandmas do, right? ;) We love you, Mom, and are so so thankful for you! Hope you have the BEST day! Tab and I got back on Wednesday from our San Diego getaway! I have a full recap coming Monday and Tuesday but I got lots of questions about an outfit so I'm sharing what I packed. Just in case you're like me and in the market for some new spring items! And let's talk about that VIEW!!! 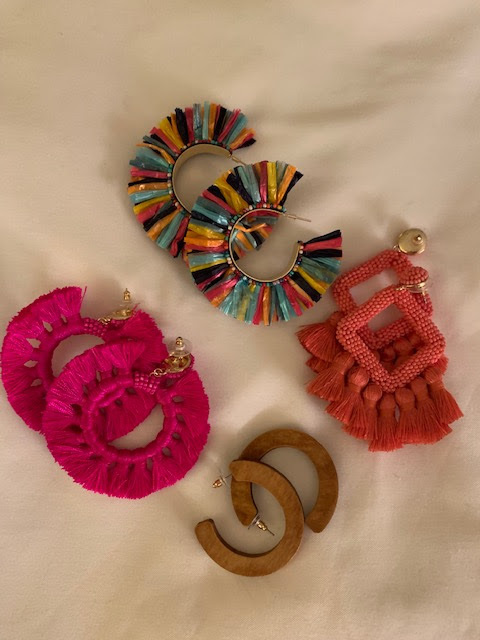 These are the earrings I packed. Give me ALL THE SPRING colors! And these are a few of the outfits I wore on the trip. This white eyelet top is on sale and when you add it to your cart, it's an additional 40% off! GREAT deal! I'm wearing a 6. You know us McKinney girls love our town...a FAVORITE always! 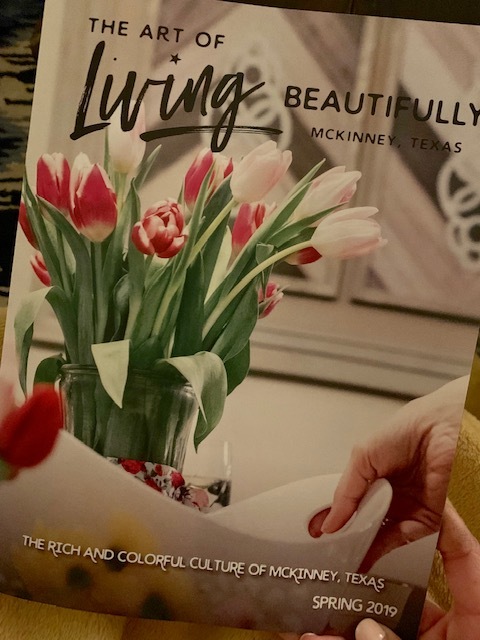 :) One of my girlfriends, Lauren, is the editor of McKinney's online magazine, The Art of Living Beautifully. Great news...they just started printing the publication and it is absolutely gorgeous! This picture does not do it justice. If you're local or would like to keep up with McKinney happenings, check it out! You'll absolutely love, Lauren, and I hope you love learning more about our town. Another FAVORITE? Getting pictures like this from friends when I'm out of town. Can you tell Bowen was enjoying himself at a friend's birthday party? We have a busy weekend of baseball, volleyball, and wedding fun all happening! Hope you have a great weekend! I always kind of like when the kids have a day off school. It's a chance for all of us to relax a bit and get out of the routine. Love that eyelet top, so pretty. Have a great weekend. I love all of the earrings, and that white eyelet top is absolutely adorable!!!! Glad you had such a great trip! Happy Birthday Tina!!! Your mama is one of my FAVORITE people!!! Happy birthday, Tina!! We think you are pretty amazing! Your San Diego trip sounds amazing, can't wait to hear more! Aren't lazy mornings the best? :) Enjoy your weekend! Moms are the very best! No matter how old you are, you always need your mom! Hope she has a great day! Amen on the getting back into cooking too after vacation! 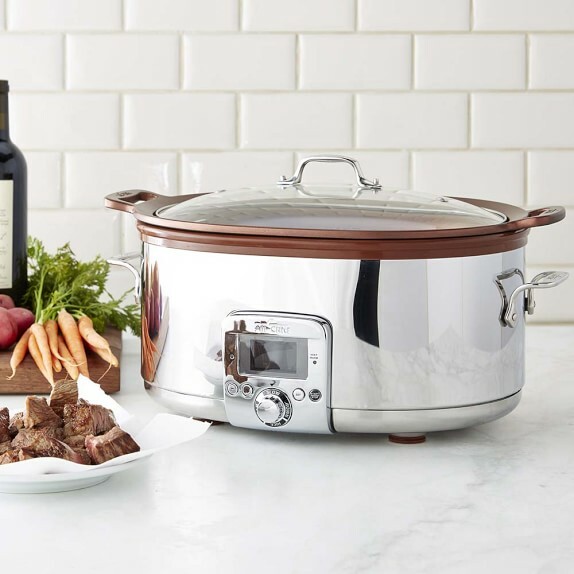 How pretty is that slow-cooker?! And those earrings are so fun!! I love your style and look forward to your Friday Favorites post every week! My kids actually ask us to leave for short trips so they can spent more time with their grandmas! LOL. Sounds like fun was had by everyone. Bless your Mama. Thanks for hosting and I hope that you have a wonderful week. Oh how I love that embroidered top. I'm needing to add a few more spring tops to my wardrobe !